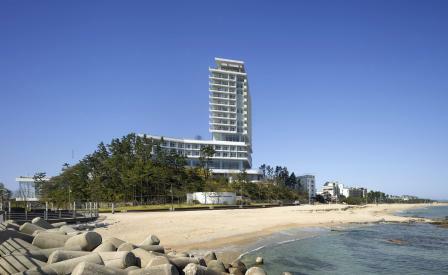 The isle of Gangneung is a treasured holiday spot in South Korea. With the East Sea, Gyeongpo Lake, and the Taebaek mountains that veer towards North Korea all in view, the idyllic locale is not only of sentimental value for South Koreans, but also journeyed to regularly for the ancient temple, sitting on top of the hill, that makes full use of this vantage point. It’s here that the Seamarq Hotel, a gleaming, elegant tower designed by Richard Meier & Partners, stands. Formerly the Hyundai Hotel Gyeongpodae, the property has been transformed into a luxurious, two building hotel as the region prepares for the 2018 Winter Olympics in PyeongChang. Situated on the hill’s summit plateau, the hotel’s tower is a poetic vertical form that emerges from the landscape, while its banquet hall and accompanying facilities, such as the wellness spa, amphitheater and exhibition hall, spreads out across the surrounding pine forest and towards the lake. Conceived to be at one with the landscape, Richard Meier & Partners was particular about treating the build and site sensitively, even collaborating with James Corner Field Operations as a landscape consultant. With 150 guest rooms, an indoor and outdoor swimming pool, an expansive observation deck and a restaurant serving elevated Korean cuisine, the Seamarq brings with it all of the creature comforts one might expect of its avant-garde design. The building’s restrained profile, which equips rooms with floating balconies and preserves guests’ privacy with articulated planes, creates a dramatic silhouette without interfering with the stunning natural views. The reverence for its natural habitat is mirrored in the hotel’s sophisticated palette. Granite, wood and neutral coloured accents create a serene atmosphere indoors that makes the scenery the star.